From March 15 through July 15, find a RITZ logo online, and upload it at www.RITZscan.com for a chance to win the Top Your RITZ Scan Sweepstakes 2018 and a $100,000 grand prize. Plus, you could win a $100 Visa Prepaid Reward, awarded daily throughout the Sweepstakes Period. Who Can Enter? The Top Your RITZ Scan Sweepstakes is open only to residents of the 50 United States, the D.C., and Puerto Rico, 18 years of age and older as of the time of entry. When To Enter? Sweepstakes begins at 12:00 am ET on March 15, 2018 and ends at 11:59 pm ET on July 15, 2018. 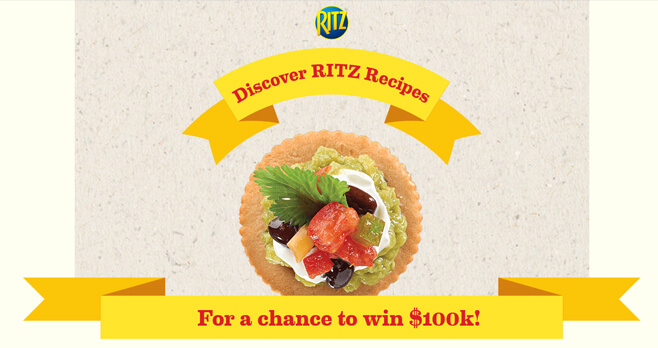 What Is The RITZ Sweepstakes Prize? The Grand Prize consists of a $100,000 check. Who Are The RITZ Sweepstakes Winners? For a winner list, visit http://bit.ly/2wo7bdr. The winner list will be posted after winner confirmation is complete. I love this biscuit! Hopefully i win so i can visit my family in the philippines and help them esp my Mom!???????? Hi “RITZ”!…… “NOBODY BUT NOBODY” can ever tell my wife and I how great your crackers are! “THEY ARE NOT ONLY “SECOND TO NONE’ ’cause their is no “SECOND TO NONE” when it comes to indulging in the terrific taste the “RITZ CRACKERS” have. Everyone of them have their own special taste. And the “RITZ ROASTED VEGETABLES ARE SO UNIQUE IN FLAVOR AND HEALTHFULLNESS….. NEVER, NEVER, EVER STOP MAKING THEM”…PERIOD! RITZ should send a box of the “ROASTED VEGETABLE CRACKERS” to their “CEO” I know after tasting them he would be extacted! ” HAVE A “RITZY DAY”! “HAVE A HEYDAY”! What do you mean awaiting moderation? My message is how I feel about “”RITZ”. Who doesn’t enjoy “putting on the Ritz” with those buttery, velvety crackers. My favorite are the Hint of salt. Whole family can’t wait for rainy days, so we can get in to the Ritz……no reservation required.. I live Ritz crackers, my little 2 year old granddaughter will put a whole Ritz cracker in her mouth, she lives them!